Interactive House - Midhaven Homes Ltd.
Interactive Green HouseYour Midhaven home makes it simple to live a fresh new lifestyle. R24 batt insulation in 2x6 exterior value engineered wall system reduces excess lumber, allowing for more insulation, less thermal bridging, reducing heat loss and lowering heating and air conditioning costs. R60 attic insulation is the most effective way to reduce heat loss and keep your home comfortable year-round. Light, maneuverable and environmentally friendly these push mowers start with a light push and cut your lawn with precision. Growing your own vegetables is an easy and economical way to simplify a hectic lifestyle. Composting can convert a large portion of your household waste into hearty soil. This by-product of natural recycling will help your garden grow. Apple trees are probably one of the most common and satisfying fruit tree. This attractive and low-maintenance fruit tree is a simple and rewarding addition to any organic garden. With a simple one-handed movement, the wall-mounted retractable clothes dryer unfolds to reveal a drying length of 25 meters in space. On the building site we have a fully integrated waste management plan and all contractors working on our site are partners in our waste reduction initiative. Double layer laminate shingle with Weather-TiteTM roofing system delivers superior protection homeowners can count on. Low VOC (volatile organic compounds) paints, adhesives and sealants. These low VOC products will help to reduce harmful gas emissions and to create a healthier, fresher living home environment. Ultra-quiet fans provide better efficiency and comfort than a regular “builder model” fan. Kiln dried lumber is used to eliminate warping and splitting, thereby reducing drywall cracks and nail pops. 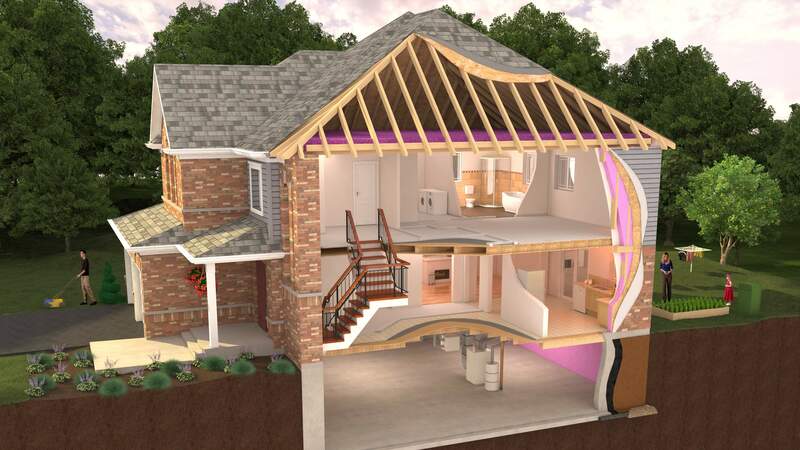 Optimized framing design increases the amount of insulation in the walls which results in a more efficient, comfortable, and cost saving home. ENERGY STAR® qualified front-loading washers use 35 to 50% less water and 30% less energy than standard washers. They also use less detergent. Dual flush toilets allow you to reduce your water consumption with each flush and lower your monthly water bill. Dual-flush toilets have two different settings, one for light, and one for heavy flushes. Save water and energy with low flow showerheads and faucets. High-efficiency showerheads use 40% less water than conventional models. High-efficiency faucets use up to 30% less water than standard models. Enviro Select Carpet is crafted from recycled materials or as few natural resources as possible, with minimum waste. ENERGY STAR® qualified light bulbsSaves money and uses about 75% less energy than a traditional incandescent bulb and lasts at least 6 times longer. ENERGY STAR® qualified Refrigerators are 20% more efficient then standard models. ENERGY STAR® qualified dishwashers save energy by using improved technology and less hot water. On average they use 25% less energy and 20% less water. Quartz Countertops are beautiful, low maintenance, eco-friendly (low VOC), and long lasting. 90% Thermal Efficient Gas Water Heater. It can deliver endless hot water for showers with a continuous flow of over 3 gallons per minute. All ENERGY STAR® qualified homes are evaluated and tested by a certified independent third party to ensure that high standards are achieved. 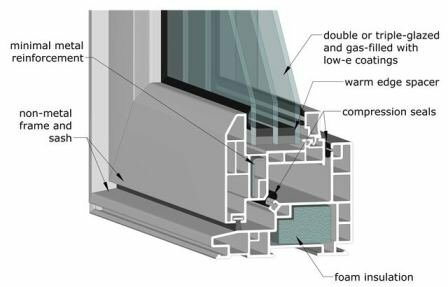 ENERGY STAR® qualified windows are Triple pane, low E argon filled, delivering superior performance and home comfort. ERV (Energy Recovery Ventilation system) replaces old stale air from inside with fresh air from outside, while retaining the heat and moisture from the air. High efficiency gas fired, single stage furnace with a DC brushless motor has a maximum efficiency of up to 95.1% AFUE. The DWHR uses energy from the outgoing warm drain water to pre-heat incoming fresh cold water so that the hot water heater does not have to work. Sealing ductwork helps reduce loss of air-flow, ensuring that every room is efficiently heated and cooled while providing a more comfortable and energy efficient home. Advanced waterproofing, drainage membrane, and wall insulation make the basement a drier, warmer, fresher, and all around more comfortable useable space. All exterior walls are wrapped in a house wrap for a continuous air barrier and additional weather proofing. Gas fireplaces are clean, efficient and require little maintenance. Programmable thermostats save energy and money on utility bills by allowing residents to pre-set home temperatures according to various lifestyles and preferences. Low VOC (volatile organic compounds) paints, adhesives and sealants. Save water and energy with low flow showerheads and faucets. Enviro Select Carpet is crafted from recycled materials. Superior Basements, warm & dry. A Midhaven ENERGY STAR® qualified home is a healthier home. Our Houses are designed and built to be healthier, less costly, and above all less taxing on the environment. We implement better building techniques and use longer lasting materials, and by recycling leftover materials which equals greater savings for our homebuyers and the environment. Our Green homes are expertly sealed and third party tested to deliver year around energy savings. Please take a moment to see how our homes are different. R24 batt insulation in 2×6 exterior value engineered wall system reduces excess lumber, allowing for more insulation, less thermal bridging, reducing heat loss and lowering heating and air conditioning costs. Higher levels of insulation combined with effective air sealing, keeps us warmer in the winter, cooler in the summer. R60 attic insulation is the most effective way to reduce heat loss and keep your home comfortable year-round. R31 Spray foam insulation is used on exposed floor areas over unheated spaces that contain living areas such as garages for warmer floors and a more comfortable living space above. All exterior walls are wrapped in a house wrap for a continuous air barrier and additional weather proofing. Draft resistant electrical boxes are installed for increased air tightness, and energy efficiency.Expanding foam insulation around all windows and exterior doors for a better seal, reducing drafts, and moisture penetration. The building envelope is fully caulked at all perforations, including utilities, vents, doors, and windows. Advanced waterproofing, drainage membrane, and wall insulation make the basement a drier, warmer, fresher, and all around more comfortable usable space. R-20 Full height basement wall insulation is installed 6” from the floor. A dry and comfortable basement means a dry and comfortable living space above. Basement ductwork joints are taped to improve efficiency and airflow, ensuring comfortable living in every room. ENERGY STAR® qualified windows are triple thermo pane, Low “E” Argon gas filled, delivering superior performance and home comfort. Also reducing heat loss and gain, delivering superior comfort, less condensation, and better protection of interior surfaces from damage. ERV (Energy Recovery Ventilation system) allows fresh air into a home, while retaining pre-conditioned heating and cooling between incoming and outgoing air streams. It takes less energy to heat/cool the air you bring into your home, ultimately saving you money on heating and cooling costs. The ERV also greatly improves the indoor air quality and is especially important for children and people with any environmental sensitivities. High efficiency gas fired, single stage furnace with a DC brushless motor has a maximum efficiency of up to 95.1% AFUE, providing a quieter furnace with more heat for less money. The DC brushless motor uses a fraction of the power of a traditional AC motor. This advanced blower motor provides effective air distribution throughout the house. Combined with well-sealed ductwork, the HVAC system will help maximize comfort and energy savings from the home heating system. How it works: The DWHR uses energy from the outgoing warm drain water to pre-heat incoming fresh cold water so that the hot water heater does not have to work as hard to meet hot water energy load. The DWHR is maintenance-free with no moving parts to break down. It is environmentally friendly, reducing your hot water energy consumption by up to 40% while reducing greenhouse gas emissions. Gas fireplaces are clean, efficient and require little maintenance. With a gas fireplace, when the gas supply is shut off, the fire goes out immediately. Because direct-vent gas fireplaces are sealed combustion units, there is little chance for toxic combustion gases to spill into the home, and efficiency is improved because they use no inside room air. Programmable thermostats save energy and money on utility bills by allowing residents to pre-set home temperatures according to various lifestyles and preferences. Homeowners can save up to $180* a year by properly setting their programmable thermostats and maintaining those settings. Midhaven homes set the Green standard. Our Houses are designed and built to be healthier, less costly, and above all less taxing on the environment. We implement better building techniques and use longer lasting materials, and by recycling leftover materials which equals greater savings for our homebuyers and the environment. GreenHouse certified homes are expertly sealed and third party tested to deliver year around energy savings. Saves money, about $6 a year in electricity costs and can save more than $40 over its lifetime. Uses about 75% less energy than a traditional incandescent bulb and lasts at least 6 times longer. Produces about 75% less heat, so it’s safer to operate. Reducing your energy bill and minimizing home maintenance. Save water and energy with low flow showerheads and faucets. High-efficiency showerheads use 40% less water than conventional models. High-efficiency faucets use up to 30% less water than standard models. The less water you use in your sink and shower, the less water you’ll have to heat and heating water uses energy. Dual flush toilets allow you to reduce your water consumtion with each flush and lower your monthly water bill. Dual-flush toilets have two different settings, one for light, and one for heavy flushes. 90% Thermal Efficient Condensing Gas Water Heater. This condensing water heater provides a much greater heat transfer surface than a standard induced draft gas water heater, resulting in 90% thermal efficiency and a much higher hot water output than a standard 67% energy efficient water heater. It can deliver endless hot water for showers with a continuous flow of over 3 gallons per minute. Low VOC (volatile organic compounds) paints, adhesives and sealants. These low VOC products will help to reduce harmful gas emissions and to create a healthier, fresher living environment. Enviro Select Carpet is crafted from recycled materials or as few natural resources as possible, with minimum waste. This carpet has low VOC emissions, and all their facilities are powered by 100% renewable resources: hydroelectricity and window power. Energy Recovery Ventilator (ERV) is used for bringing fresh, filtered air into the home and it also recovers heat & moisture from the exhausted air for improved ventilation and a more comfortable and healthy home. Double layer laminate shingle with Weather-TiteTM roofing system delivers superior protection homeowners can count on. From its eave protection and underlayment right up to its top quality shingles. Small steps make for big change. Have you considered an apple tree? Apple trees are probably one of the most common and satisfying fruit tree. This attractive and low-maintenance fruit tree is a simple and rewarding addition to any organic garden. You can enjoy multiple kinds of apples on one tree! With multiple varieties grafted onto one rootstock you can enjoy more variety and extended harvests in less space. Fresh fruit at your fingertips! Looking for a way to save on rising energy costs? Love the smell of clothes dried outside in the sunshine, but have no room for a clothesline? With a simple one-handed movement, the retractable clothes dryer unfolds to reveal a drying length of 25 meters space enough for a full load of laundry and hanger hooks on the end. This handy wall-mounted dryer eliminates the need to carry, set-up or store a washing line, and will fit even the smallest outdoor area, instantly folding away into a compact, space-saving unit. Why compost? Good for the planet – Composting can convert a large portion of your household waste into hearty soil. This by-product of natural recycling will help your garden grow instead of emitting greenhouse gases and taking up real estate at a landfill. Good for your wallet – You could pay for the same stuff at a garden centre every year but homemade compost is absolutely free (once you have the composter). Great for your plants – If they could talk, they would thank you for feeding them nutritious compost. Growing your own vegetables is an easy and economical way to simplify a hectic lifestyle. Vegetables are actually some of the easiest plants to grow, especially from seed. With the constant availability of fresh vegetables from your garden, you won’t be able to resist them, and the kids will love getting their hands dirty too. We make it easy to get started with a raised garden bed in your back yard with soil and a vegetable garden seeds starter kit. Why Choose a Push Reel Mower? Healthy exercise while enjoying your yard!